If you run a property development or residential building company it is useful to make introduction arrangements. Commercial surveyors / agents will usually prefer a straight commission in accordance with their standard terms, not yours. This introducer’s agreement is for situations where you make an arrangement with someone who is not in business as a commercial surveyor / valuer / agent. 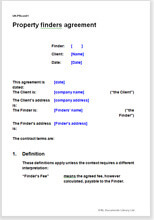 Although the business framework provided by this agreement is firm and explicit, it leaves the parties working together “as and when” it suits the finder / introducer. Neither party is under a tight obligation to work with the other, but if the finder / introducer succeeds in finding suitable property, then all else clicks into place.